The first names out of the hat were Amy and Elaine. I have contacted them by email. Many thanks to all who entered. The next newsletter will come out sometime around Easter and will feature a contest for Compromising Miss Milton. Manuscript Makeover is really making me think. It has solved several problems and provided enlightenment. For example, Lyon makes the note that often in first drafts etc, the protagonist seems flat. It is because the subtext etc is needed. You really do have to bring out the emotion and bleed on the page. Subtext is all. She also divides things up into ordinary scenes and Big Scenes and points out in Big Scenes everything needs to be more dramatic. You also have to foreshadow the scene. Anyway, the way to resolve some of my problems was right there staring me in the face. It will mean a few tweaks but the ending should be much more satisfying. It has been awhile, a long while since I have done a craft post. 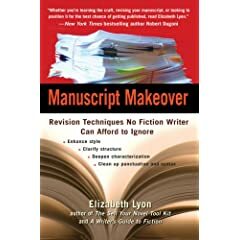 Recently I discovered the book, Manuscript Makeover Revision Techniques No Fiction Writer Can Afford to ignore by Elizabeth Lyon and I suspect that the book will eventually be on many fiction writers shelves, right next to Self Editing for Fiction Writers by Brown and King. This book is not about crafting a novel but rewriting and revising. It does what it says on the tin. It is not flashy but full of good ideas and has helped give me ideas of how to improve the current wip. Divided in several sections-- Lyon first looks at the novel outside in with techniques about revising for style. Most published authors do not need this section and it is amply covered in Self Editing but it is interesting to see her take. Then she goes into the structural problems, mainly using a 5 act structure and finally she looks at character and how character drives the story. Each chapter is has boxes of easy to digest info and the chapter summaries with check lists. For example, the chapter on movement and suspense also includes a section on why a hero might be considered passive and what to do about it. And there is a chapter on character dimension and theme which from my POV is worth the price of the book. It set light bulbs off and it reminded me of what to look for in my characters. In other words, it helped me solve problems by reminding me to ask question of my characters and reminding me of the pitfall. For example, yes I have a back story wound but without the desire to go beyond and actively change, the heroine can seem passive and static. The reader needs to see the struggle. There is a ton of info here. And it is up the writer to use it. As Lyon points out in her introduction -- different writers work to different method. Dean Koontz in his last typewritten novel figured that he did approximately 31 drafts of the novel (based on the amount of paper used) before he reached the end. He was also told about that novel by his publisher that he was a midlist suspense writer and he should cut the novel in half. he cut five pages. The novel, Whispers went to number 5 and has remained in print for 2 decades. Other authors say to revise a novel no more than 3 times, keep marketing, and writing new stories. Eventually you break in as your writing improves. Each to his own. She recommends taking the book and making it your own.using what you need. As she says, encapsulating the whole conundrum of writing craft books -- there is a world of difference between reading about how to revise and actually applying it. I intend to apply it to my writing but then I love revising and the whole process of trying to get my words to convey my vision. It is a book that is most useful if you have the raw material (i.e. a first draft) rather than if you are crafting one. And my poor critque partner is probably going to get me being rather tough on her as the book has given me Ideas! Sometimes you just need to remember to breathe. The upshot is the lymph oedema clinic beckons so I can learn how to manage it. Lymph oedema is about managing, rather than curing. It is why people used to say to put your feet up so you do not get permanent swollen ankles. With swollen forearms -- they will eventually get me a special compression bandage etc. The reason why you must see the doctor if you think you have repetitive strain injury is that a swollen forearm can indicate deep vein thrombosis or kidney problems or breast cancer. It can also just be idiopathic. But they have to eliminate things first. With RSI you will not be able to have a wide range of movement. Now all I have to do is edit the wip and wait for my editor's verdict on the other one. Today is my birthday (not yesterday as Donna Alward put on the PHS blog). I have always enjoyed being born on the 26th. People born on my birthday include General Douglas MacArthur, Paul Newman, Jose Mourinho (former Chelsea manager, 47), Martin Dunn (the editor in chief of The New York Daily News), Christopher Hampton (playwright) and many others. It is St Eystein's Day -- 12 century the archbishop of Nidaros near Tronhiem who worked to bring the Norwegian church in line with other Europeon churches (it is somehow appropriate to have a Norwegian bishop saints day). In fact tonight the Viking festival Up Helly Aa will be happening on Shetland. This is a Victorian recreation of what a Viking festival could be like but not less inspiring for all that! Also in 1790 Cosi Fan Tutte had its world premiere in Vienna. One good thing that happened to me 25 years ago is that I started going out with my husband. He remains the best birthday present a girl could get! I am over at the Pink Heart Society discussing Rupert Penry Jones in the Male on Monday slot. I am a recent convert to Spooks and really enjoyed him in 39 Steps. It means that I will have to try and catch the new series of Whitechapel when that comes out later this year. And I do think he will provide the inspiration for my next hero but one (ie my current heorine's brother). And I have finished my current wip and can go into editing mode. After that it is a quick Roman Undone to see if I can write short and sensual. I have the Sunday spot at Unusual Historical this week so there is a copy of Sold & Seduced up for grabs. And on Sunday at Pink Heart Society, it is Super Sunday with editor Victoria Curran giving the latest inside scoop about Superomance. If you are interested in that line, you will not want to miss it! The dogs decided to have a war and attack their beds so fluff was all over the kitchen floor. The kittens decided it was a good day for mountaineering and have been climbing the curtains. All this and I am about 10 pages from the end of my current wip! The kittens have also visited the V.E.T. They were too little to be microchipped but have had their first vaccinations. And as they had fleas, they have been de-fleaed and wormed. They are very sweet...and definitely male. They will be for the snip when they are about 5 months so they do not start spraying. It also made me laugh -- the ad next to the article is for a Pandora bracelet. Both Kate Hardy and Fiona Harper know how much I envy theirs...Is this a sign? Oh and two or more kittens is a kindle. Does anyone know what two or more puppies is? I am blogging today at Tote Bags about the photo shoot I did for Living North Magazine. The February edition is now on sale and I am the featured article. You can read more on the Living North website. I feel terribly glamourous now. Heathcliff and Mr Darcy decided to be Very Bad Modem Cats and run all over my desk using the printer as a safehouse. I came back to discover that 40k of my latest work in progress had disappeared. Thank heavens my youngest heard my scream and calmly pressed the undo button. The words reappeared. Phew. However every 6th line was a new paragraph. (still not sure how they did it!) and I went and fixed that. Modem cats do not learn. Modem cats like to chase the computer mouse and think that stamping on computer keys gives a good sound. Modem cats bring a whole new urgency to backing up one's work. Modem cats also purr and sleep on ones' lap. Ther are reasons for having modem cats. With the thaw, the mice have begun moving again and the new trap in the basement has caught two mice. There is a rather large gray mouse (not a rat) who has been seen going in and out of the feed shed. Both my youngest and I would dearly love to catch it. However, the amount of mouse damage in the feed shed appears to be abating. I suspect the mice in the basement also make a pit stop in the feed shed...And I rather concentrate on trapping them in the basement. Currently I am waiting for the AA to show up and start my car. I suspect the battery is now low...Sigh. But I am glad that we have home start. The wip is progressing and as various bodies are back at school or work, I have no real excuse. The kittens are growing rapidly. They are now allowed out of my study but do not hesitate to come back and meow when they think it is feeding time. They enjoy hunting toy mice and balls, so it is only a matter of time before they become fully fledged mousers. Tess thinks the kittens are hers and does every so often try to clean them...the kittnes are not so fond of this. The dogs also assume if the kittens do not finish their food, it is fair game. Other places in the UK remain suffering but up here in Northumberland, we are experiencing a thaw. The wind is from the south and the snow is melting away. The main roads are clear, and the trains are running. The coal and the heating oil has now been delivered. And it begs the question as to why the heating oil lorry could make it up the hill yesterday and the bin men can't. The bin men did spend time clearing pavements which was good of them, but my main bin has not been emptied since before Christmas! Tomorrow, it will be recyclables again and they will not be taking the other garbage until the Monday after that! Provided the weather holds. My eldest went back to University today. He is doing well but is ready to get on with his studies. It is easier the second time they go. My daughter has various A level tests next week (no postponement) and ditto for the youngest and his GCSEs. My fingers are firmly crossed for the thaw to continue. Kimber An did a review of The Viking's Captive Princess on Enduring Romance that made me smile. In particular she said -- This is book three in Michelle Styles' Viking series and I can guarantee there will be more (because if I don't hear more about a certain secondary character, I'll go totally Viking in the bookstore). I would love to know which secondary character she means. There are two possibilities really --Erik the Black and Thrand. Although I think she means Thrand and it may happen, but at the moment, I am focused on my Regency/Victorian stories. I am super excited about writing a couple in the Ottoman Empire. However first, I have to finish the one I am currently writing which sets up the second of the Ottoman Empire stories. But really if people want me to write more Viking stories, they do need to contact my editors rather than going Viking in bookstores. My editors do like to hear feedback and requests for stories of secondaries. (I did send a copy of the review to my editor) Otherwise they do sort of let me write in the time periods that I want to write in (see above for my latest research obssession). My editors are lovely that way. It is snowing again and they have stopped gritting as much. This means the hill where I live will become totally treacherous. My husband said that the A1 yesterday was littered with accidents. Basically in snow and ice, people do need to slow down. You want to avoid skidding, rather than practicing skid control. I have started investigating Public Transport. The only trouble is that it is pretty poor and it is difficult to carry shopping home... It will all get worked out but I determined that snow is not going to stop me. It is a matter of taking the time. My youngest two have exams next week and these are going ahead. Luckily they can walk to school. Somewhere in the back of my mind, I remembered the warning but I remembered it far too late. The words only came back to me as I pressed the starter. The car chugged once and then died. No one's fault but my own. Somewhere, someone told me to start my car every few days in the cold so it would start. I forgot until my car wouldn't start. Then I remembered and felt stupid. So now my life is littered with un-done to do lists and I am stranded. Or rather the proposed excursion to the heady heights of Tesco with my eldest has been postponed until my husband returns. Chile the Labrador , however loves the snow and has been acting about the same age as Hardy and Tess. As the winter weather looks set to continue, I have investigated the train. It is doable for certain outings next week. In an act of defiance against the weather, I have paid the remainder for the book research trip to Egypt. Somewhere warm! The heating oil people were lovely but informed me that there is a 2 week backlog with oil weather permitting, of course. Luckily it was just a precaution...The oil should arrive just as the current batch runs out...but I have turned the thermostat down and put another jumper on. I have also ordered more coal. There is supposed to be more bad weather on the way. Note to Caroline: yes it is a bloody struggle to get some of my words done before turning on the Internet, particularly as this little voice keeps whispering but you need to check if the children's school is open (it isn't). Still in 6 weeks time this too will be a habit and productivity will return. Lots of snow and plunging temperatures. The children's school remains closed for a second day. We have done some sledding, throwing of snow balls etc. and still the snow keeps coming. It was to do with the weather pattern and where the highs developed. There are predictions that Northumberland could see as bad a winter as the one in 62-63 where 20 foot high drifts developed in the Allen Valley. I have seen the pictures in the Courant! And yes, I know lots of other places in the world regularly get this sort of weather. It has to do with expectation and preparedness. And despite going to university in Minnesota and living over here for 20 plus years, I remain a wimpish SF Bay Area girl at heart and hate driving on snow. My new regime is going well but it is hard. However, it does take 6 weeks to get into a habit. A very good way to start the New Year was to discover two lovely reviews of The Viking's Captive Princess -- one on cataromance and the other on the Pink Heart Society Review. Julie Bonello puts a lot of effort into her reviews and has reviewed every single one of my books so I was curious as to what she might think. Clear a space on your keeper shelf because Michelle Styles has penned another winner! The Viking's Captive Princess is another captivating tale from this wonderful storyteller featuring a heroine to admire, a gorgeous Alpha male to adore, a fantastic cast of fully-fleshed supporting characters, searing emotional intensity, dramatic action, powerful romance and wonderfully rendered historical detail which never interferes or overwhelms the story. Thank you Julie for making my day! My regime continues. It is the early days before a habit is established and after the initial enthusiasm vanishes that are the hardest. The newspapers are currently full of good advice. One current theme seems to be -- do not diet but savour your food. Eat slowly. If you feel you must eat cake/drink alcohol/have cream do it on a specific day. For example Wednesdays and Saturdays as then you are never waiting too long for a treat and are less likely to binge. The kittens are can be seen by the above picture are in a playful mood. They are currently conducting a war on my legs. Thankfully this period of absolute playfulness should be short lived. We were supposed to get a light dusting of snow, covering the four inches that we had yesterday. Instead we are getting a blizzard complete with a biting wind. It brings back memories of when I was at Carleton... The puppies are enjoying the snow and chasing the sled when we go sledding. The postman became stuck and could not go further up the bank because the Council had not gotten around to gritting. He predicted more snow and has been proved right. Day 2 of the new regime and I am finding I have to think and remind myself -- Internet second, writing first which shows how bad my habits are. With weight management, I have stepped on the scales, and it is not a pretty sight. My sister in her wisdom has suggested to focus on losing 10% in 2010, rather than trying to lose the whole lot. It seems good to me. Once I have done that, then I can look at losing more. The kittens (as can be seen from Mr Darcy's photo) find my messy desk fascinating.